Change of plans, I wasnt suppost to be doing another IM distance race until Challenge Copenhagen, but the race I was suppost to be going to was cancelled. So I am off to the land of Hiro, Maki and Sushi. Must say a big thanks to Hiro for getting me a start in his native ironman, if it wasnt for him I wouldnt be going. Other news this week, the All Whites took on the world ranked #20 Australians in a warm up friendly for the World cup. We had them rattled, up one nil after 20 odd minutes and the boys where playing out of their skin. Then come some 2 red card offences from the Aussies which go unpunished! Even the aussie coach couldnt believe it they finished with 11 men. So onto the the second half and the Kiwi’s are still up one nil, some more chances go astray that we should of put away. But then the aussies sneak in a goal due to a lucky deflection. Into overtime, and the clock reads 93min, with the 3min added time up, 1 all, and then it happens, we fall asleep and in the last 10secs we get a goal against us, Yes I am very dissapointed. A draw would of been a good result for us, but it definetly points to some good form for the cup. So, rewind a few years to Jan 2008, I am down in Wanaka to compete in my second long distance race. 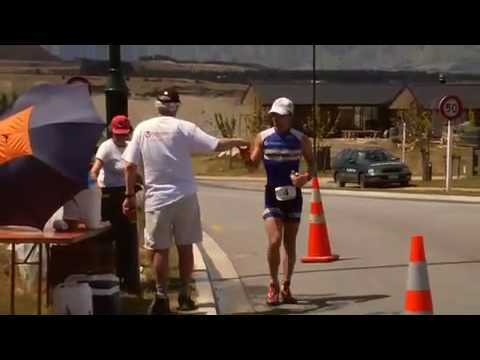 The previous year I competed in Taupo and had a massage a few days before the race by a really nice Maori lady called Dot, she didnt rub very hard, but my arms and back felt great for the swim. So I decided that again I would get a massage before the race, I couldnt find anyone on the thursday before the saturday race, but settled on a appointment on friday afternoon. No problems I thought. Finally its all over, my arms are already feeling a little beaten, No worries I think to my self, I will be ok in the morning. Race morning dawns, wake up, get out of bed, ouch – f#%# I think to my self, my arms are wrecked. They felt like a train ran over them, fortunately the back is ok.
Times ticks on and in no time I am in the water warming up, oh no, arms are stiff. I try to keep postive and think they will loosen off once the gun goes off. Race starts, we are off, I am sitting reasonably comfy for the first 400m in the first group, then the arms start getting really sore and stiff, next thing I know I am off the back and cursing my decision of 12hrs earlier. So I tell myself, well you cant swim hard since your arms are wrecked so you will be saving energy for later in the race, I kept telling my self that, and I think I ended up about 2min down on the guys I would normally swim with. So, that was a good lesson for me. Every time I have done IMNZ since I always get Dot to give me a massage two days before and feel better for it. No deep tissue torture, just gentle pressure in the right places. To bad she dosent live in Cambridge. You are currently browsing the Keegan Williams's Blog blog archives for May, 2010.